In their book, The Story of Ross, Pat Hughes and Heather Hurley date the start of the Wye Tour from 1750, when the rector of Ross, John Egerton began treating his fashionable guests to a boat trip down the Wye. It is a pity in hindsight that there was no commemoration of the 250th anniversary in millennium year so here, in belated recognition, are a few words about the Reverend William Gilpin whose writings brought the Wye Tour to popular attention. He was born in 1724 near Carlisle and always retained a love of the Lake District scenery of his youth. He eventually became a schoolmaster in Cheam, Surrey and from 1768 he began using the school holidays to make extensive tours around Britain, sketching, and writing about, the landscape as he went In 1770 his summer excursion was to the Wye Valley and South Wales. In his sketches and writings on this and other tours, Gilpin developed his theories of the Picturesque. A landscape historian, Michael Symes, has summarised these as follows. He "draws a distinction between beauty, which pleases the eye and which is based on smoothness, and the picturesque, which is characterized by roughness and irregularity, From the picturesque point of view, a ruin is preferable to a house and broken ground to a smooth garden. .....Gilpin is concerned with what is suitable for painting (the basic meaning of picturesque), and suggests an approach based on his particular vision of the picturesque. ........ if one had to sum up what Gilpin was looking for, whether in pictures or physical scenery, it would be: variety, contrast, broken edges and lines, rough surfaces, light and shade to illuminate some parts and to hide others, and the power to stimulate the imagination." The view from the Prospect at Ross was not classified by Gilpin as Picturesque. The viewpoint was too high, the extensive scene was broken up into too many parts and there were no objects of sufficient distinction. Instead he initially called it "very beautiful" but later changed this to "amusing". 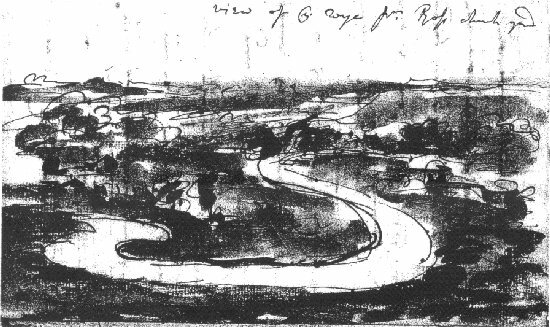 Gilpin's rough sketch of "view of R. Wye from Ross churchyard"
However, when he embarked and came to the stretch of river below Goodrich Castle it was a different story. Gilpin analysed views as if they were pictorial compositions or scenic stage sets and in this case the "area" (i.e. the river scenery in the foreground) was a noble formation, the two "side-screens" (the river banks) were distinct but finely contrasted and the "front-screen" featured a ruined castle which could well be described as "Bosom'd high in tufted trees". Overall, this view "I should not scruple to call correctly picturesque" declared Gilpin. Moving downstream the steep, wild banks of the river afforded many other picturesque views until the tourist came to the piece de resistance, Tintern Abbey. Gilpin enjoyed the Abbey on the whole, but, because of his rather exacting formulae for determining the "correctly picturesque", he was not completely satisfied. "A number of gable-ends hurt the eye with their regularity, and disgust it by the vulgarity of their shape. A mallet judiciously used (but who durst use it?) might be of service in fracturing some of them; particularly those of the cross aisles, which are not only disagreeable in themselves, but confound the perspective." 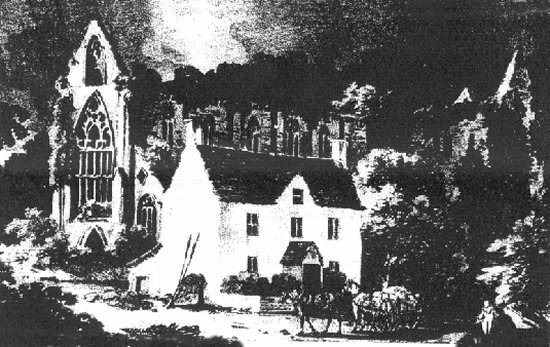 An 18th century view of Tintern Abbey. Gilpin complained that the view "is interrupted by a mean modern house, which has been built close to it." Gilpin's 'Observations on the River Wye' were not published until 1782, although they had been circulating in manuscript amongst the cognoscenti for a decade. A number of other writers published similar tourist guides shortly afterwards and by the end of the century the Wye Tour was at its height of popularity. Tourists glided in comfort from Ross to Chepstow in boats equipped with drawing tables and protective awnings. By the nineteenth century the Tour had lost some of its social cachet but remained a popular attraction, helped by the coming of the railways. William Gilpin made, and described, further tours to the more rugged parts of the British Isles, until he became vicar of Boldre in the New Forest, Hampshire. He then had to give up touring but wrote 'Remarks on Forest Scenery' in 1791. He died at Boldre in 1804. By this time Gilpin's formulaic perceptions of the picturesque had been superseded by a more rounded appreciation based on moral issues as much as aesthetic ones, in large measure due to the writings of the two Herefordshire squires, Uvedale Price of Foxley and Richard Payne Knight of Downton Castle.